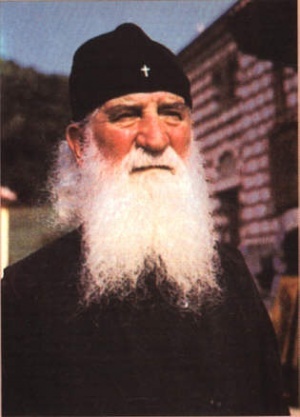 The Venerable Justin of Ćelije (aka Justin Popović; in Cyrillic Serbian, Јустин Поповић) (1894-1979) was a theologian, a champion, a writer, a critic of the pragmatic church life, a philosopher, and archimandrite of the Monastery Ćelije, near Valjevo. He was formally glorified as saint by the Holy Synod of the Serbian Orthodox Church on May 2, 2010, and commemorated on June 1 each year. Communique from the Holy Assembly of Bishops of the Serbian Orthodox Church in Belgrade April 26-May 5, 2010, announcing the glorification of St Justin. Kommentar zum HI. Evangelium nach Matthãus in German. This page was last edited on October 23, 2012, at 19:58. This page has been accessed 54,979 times.